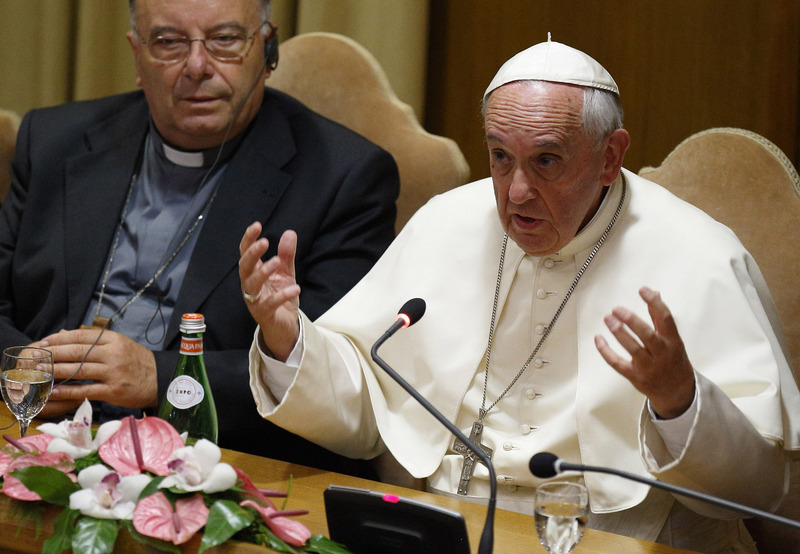 U.S. Catholic college presidents have signed a document supporting Pope Francis for his leadership on climate change. About 100 U.S. Catholic college presidents have signed a document supporting Pope Francis for his leadership on climate change efforts and committing their institutions to doing all they can to foster "open, honest" dialogue on climate issues and help form "global ecological citizens." Since the pope's encyclical on climate, "Laudato Si'," was published in June, college presidents have been adding their names to the pledge, stating that they will work together regionally and globally "to study, promote and act on the ideals and vision of integral ecology laid out by Pope Francis." The document thanks the pope for his "strong and courageous leadership in addressing the interrelated crises and ways of life" that are threatening the earth. "His leadership inspires our own," it adds. The pontiff "calls upon every person on the planet, the whole human community, to take up this urgent set of challenges, recognizing the profound religious and moral imperatives they present," the statement says. "Pope Francis states forcefully and clearly that facing these challenges will require profound changes in lifestyles, myths and mental paradigms, models of production and consumption, cultural assumptions and values, and the consolidated social and political structures that govern society today," it says. Following the pope's urging that the world community needs to take action to stop climate change, Catholic higher education leaders have agreed to commit themselves to "integrate care for the planet, integral human development and concern for the poor within our research projects, our educational curricula and public programming, our institutional infrastructures, policies and practices, and our political and social involvements as colleges and universities." "This strong affirmation by the Catholic higher education leadership internationally, joined with the overwhelming consensus of the scientific community, should silence those who try to dismiss Pope Francis' message by questioning his credibility on the issues," said Christopher Kerr, executive director of the Ignatian Solidarity Network, which coordinated the higher education commitment effort.